A drunken man who kept climbing on his neighbour's motorcycle while shouting abuse has been fined, after magistrates heard he had suffered a brain injury. Preston Magistrates' Court heard Omar Muntazeer, 32, Laurel Street, Preston, had never come to the police's attention until after July this year, when he suffered the head trauma. Since then he has been given three conditional discharges for drunken or abusive behaviour. 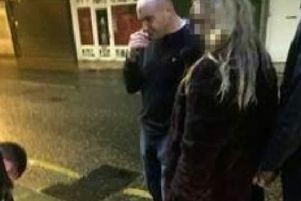 He appeared before the court for his fourth such offence, in the Richmond House area of Avenham Lane, Preston, on October 12, and admitted a charge of being drunk and disorderly. Prosecuting, Tracey Yates said: "Officers were called to reports of a man using abusive language and climbing on a motorbike that didn't belong to him. "His behaviour was causing neighbours distress. "He climbed off the bike when officers approached. He was shouting loudly and staggering. He was asked to leave but refused to comply and was abusive. Defending, Craig McKenzie, said: "Between 2011 and this year he's not someone who was before the court. "Prior to July he was working and had his own accommodation. Then he was involved in an accident and suffered a brain injury on July 17. "He has a letter from the NHS neurological rehabilitation team. In summary it describes him as having severe to moderate deficits in his memory. "He also has difficulties with his balance, problem solving skills and difficulties reading and writing. "As a result he loses his job, loses his accommodation and turns to drink. "He has no recollection of the actual incident, but he accepts that what the police say is accurate. "He has referred himself to look at issues around alcohol." The offence put him in breach of three conditional discharges. The chairman of the bench said: "We have listened carefully to the evidence of your traumatic brain injury that you suffered earlier this year. "However you've had three conditional discharges for similar offences so we are not prepared to go down that road. "It's been an awful run since September and we hope the help you get will be the end of it." They imposed a fine of £40, with a £30 surcharge.